Since having my hair done back in May (remember the balayage/ombre I got?) I've found that as expected, my hair is a little bit on the damaged side so I've got to work a little harder to keep it in that tip top and super soft condition that I'm used to. I've tried so many products to try and get it back to a better condition and I've narrowed down a few products that have really helped me get here, and that are current staples in my hair care routine. First up the SenSpa Nourishing Shampoo and Nourishing Conditioner* are amazing. They hydrate my hair, while giving it a great cleanse and it's a great starter step for my haircare routine. They're not pricey and they're well worth giving a go. Plus, the packaging is super cute. I'll regularly use a hair mask and the Richard Ward Intense Argan Age-Proofing Hydrating Treatment* is honestly so so incredible. You pop it onto your hair after you've washed it and leave it on for a while. I usually pop on a face mask while I do this and give my body a good scrub while I allow it to penetrate through and work its magic - it's great for a pamper session. After I've washed my hair, I swear by the Lee Stafford Bleach Blondes range. The Lee Stafford Bleach Blondes Golden Girl Oil* and the Lee Stafford Bleach Blondes Conditioning Spray* work incredibly well in unison. It keeps my hair super hydrated before I dry it and keeps the colour as I wanted. The Conditioning Spray is tone correcting as it's filled with violet pigments to subtly work to keep those brassy tones at bay while hydrating alongside this. The Golden Girl Oil works in a similar way, but I'd say that this is what really hydrates my hair but it too does work to get rid of the brassy tones in the colour. These products are a dream team and I'm so in love with them. 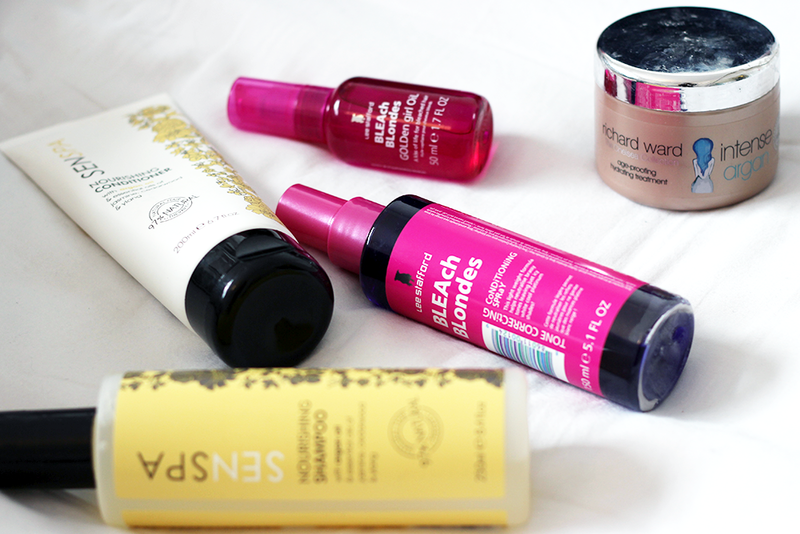 These are my wonder products to help keep my hair hydrated... I love them, but I'm always looking for more to add in. I am a beauty addict after all.